Don Pedro Sanchez Elll Puppy Dog has a beeg problemo! No one believes he’s really royalty from Mexico, because Momma Francy Pants rescued him from the middle of the road. Worse yet, the Itty Bitty Wise Kitty Committee says that if he wants to stay, he has to ride Bubba the horse, the one who’s still in training, and prove he’s royalty. Pedro has never ridden a horse before, but as Bluff the old wise horse points out, Bubba has never carried a Chihuahua, either. 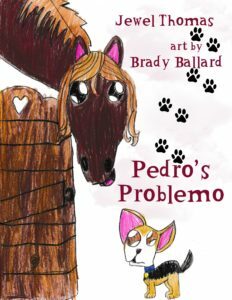 Will Pedro survive his wild ride on Bubba and be accepted by Yin The Yang, Lucky To Be Alive, and the Itty Bitty Wise Kitty Committee?